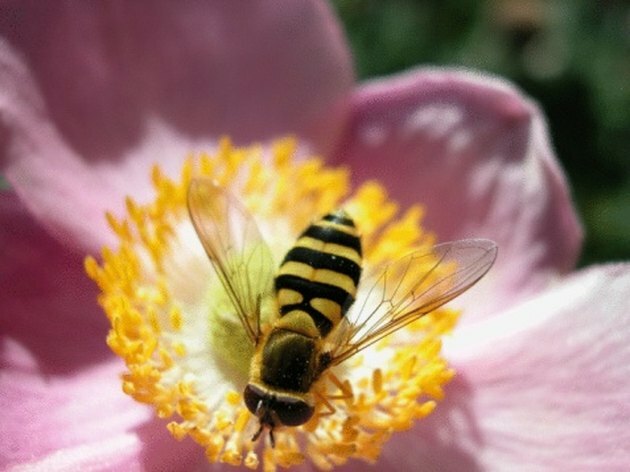 If you have flowering plants in your garden or around your home, you may experience a few visiting bees. Bees are important to the pollination of flowers and the growth of new plants, but they may not always be welcome near your home. Instead of killing these helpful insects with poisonous insecticide, it is possible to make your own homemade bee repellent that contains safe, natural ingredients. Bees only sting when they feel threatened. Combine equal parts of peppermint, lemongrass and citronella oil. If you do not have these oils available, you can use cuttings from fresh plants. Rub the oil on your hair, arms and socks to repel bees with a scent they tend to find unattractive. If you are using fresh plants instead of the oil, crush the leaves of the plants in your hand. Rub the crushed leaves over your skin. The citronella in this blend also helps ward off mosquitoes. Pour witch hazel oil into a small spray bottle. Add several drops of peppermint, tea tree or lavender oil to the bottle. If desired, you can add all three oils. Replace the top of the bottle and shake to mix the ingredients. Spray the solution on your body whenever you don't want to be bothered by bees. Bees, as well as other flying insects, dislike the pungent scent this repellent emits. Many insects, including bees, dislike hot or spicy peppers. Take advantage of this by making a pepper mixture that you can spray directly at bees. Bring 2 to 3 cups of water to a boil. Chop spicy peppers, such as jalapenos, into small pieces. Add the pepper pieces to the water. Turn the hot water off and let the mixture set. Let the water cool and then strain the water into a spray bottle. Spray this spicy water at bees to deter them. Wear light-colored clothing if you plan to be outside for a period of time. Bees see dark colors as a threat, so avoid wearing darker clothing. Do not wear sweet-smelling perfume when outside. The fragrance attracts bees. Flowery shampoos and soap are also attractive to them. Keep a leather item, such as a purse or jacket, near you, since bees dislike the scent of leather. Bees also dodge the smell of alcohol. Dab a bit of rubbing alcohol on your body to repel them. Does Peppermint Oil Detour Honey Bees?